Zones give you that freedom. 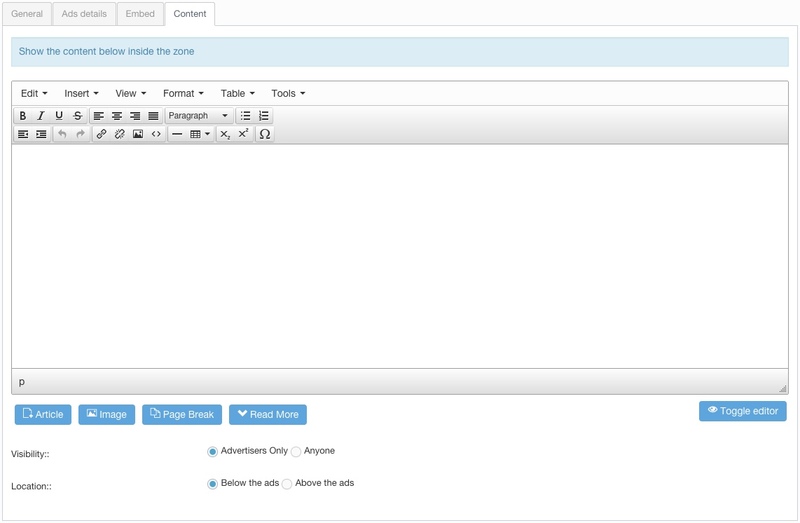 You can create an unlimited number of zones, and because each zone generates a module, the zones can fit in any module position available on your template. You can control the location of the module just like you control any other module. You can also change its title and choose the pages to display it. 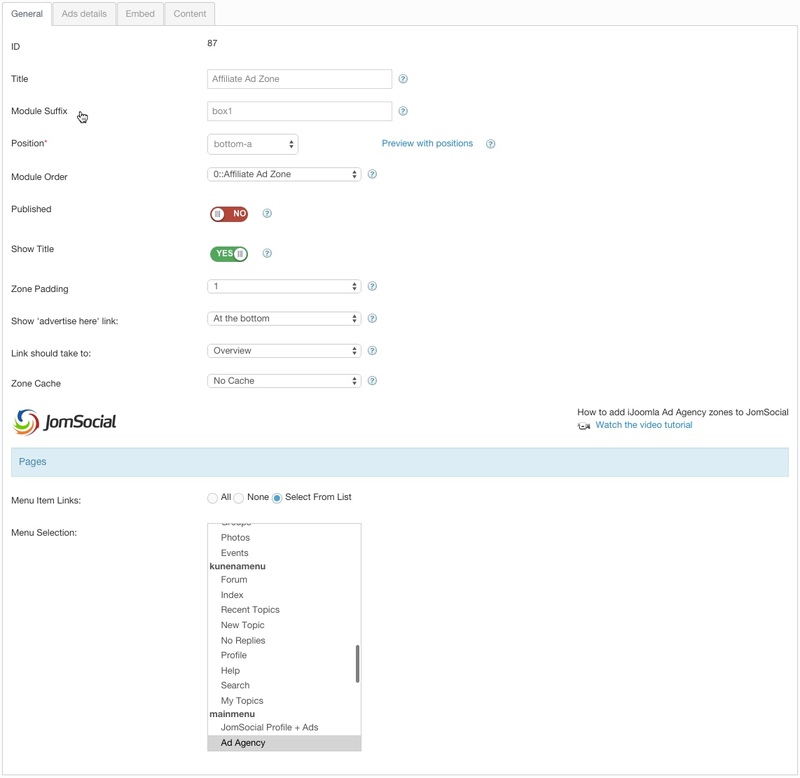 If you're using iJoomla SideBars, you can even publish zones inside articles. 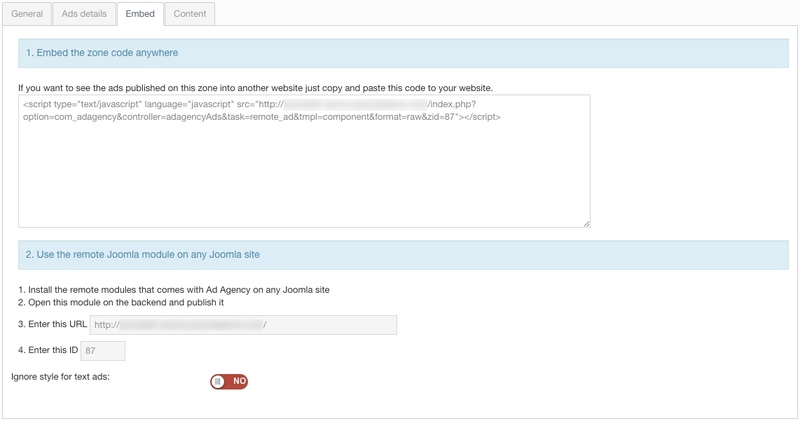 You can set the zone to show only the ads that have keywords that match the keywords in the title metatag of the article you want displayed. This allows you to display different ads based on different pages. Read more about Keywords Targeting. You can choose how many rows and columns of ads to display. Read more about horizontal and vertical ad display. Set the zone to rotate banners without having to refresh the page. Read more about Banner Rotation. Assign a default ad to a zone. This ad will only show if there are no ads or campaigns available. This will ensure that your zone is never empty. Even more, you can display your own ads or an affiliate's ad to generate more revenue. With "Advertise Here" on your zone, you can promote your advertising opportunities and get new advertisers. With our remote code, you can display your ads on a different site. Read more about radding your banners on any site. Add content below or above the zone content that's visible to either all visitors or just advertisers. This is a great way to promote your advertising zones.